ICM (#35312 or #35121), or ALANGER (#035005) Pz.Kpfw.II.L 'Luchs' and ITALERI Flak 43. During the second half of WWII, due to Allied air superiority, Germany faced an urgent need for armored antiaircraft vehicles. Between May and September of 1943 Hitler headed a few meetings dedicated to this matter, and 'Inspectorate 6' was established, responsible for the development of AA Panzers. That was the beginning of numerous projects mounting anti-aircraft guns (Flak) on any suitable chassis. 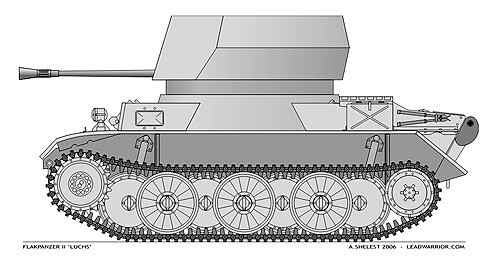 The shortage of battle-worthy tanks had influenced the manufacture of Flakpanzers by mid-1944. The cheap and reliable chassis from obsolete Pz.Kpfw.III were needed for StuG Assault Gun production, so Pz.Kpfw IV chassis were used for the construction of Flakpanzers, Several hundreds of these machines, of different variants, were built by the end of the war. One of these efforts took advantage of the modernized Pz.Kpfw.II Luchs reconnaissance tank. This version was to mount a 37mm Flak 43 anti-aircraft gun. The gun itself was to be mounted in an armored barbette, and lowered into the hull in order to reduce the overall height of the vehicle. The vehicle chassis had to be lengthened. The weight of the machine increased, so the suspension was rearranged more densely, and two additional road wheels were added to each side. The engine remained the same as at Pz.Kpfw.II L, so speed decreased, but this was determined to be less essential for a Flakpanzer. 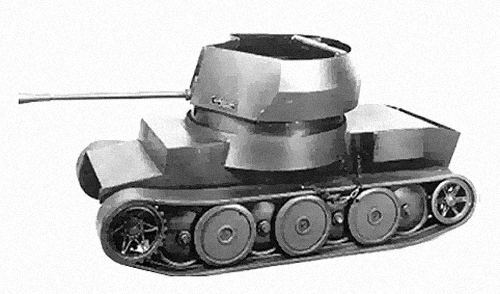 Although this vehicle was rather compact, and lower in height than the Pz.Kpfw.IV-based Flakpanzers, it was still quite complex to produce. By the end of the war, the designers had only gotten as far as the wooden mockup.